Summary: Kitchen task lighting will promote safety while accent lighting will enhance your kitchen. A well ventilated kitchen will prevent odors from entering other areas of the home. The free standing kitchen range is typically located under an cabinet section that is designed to allow for the installation of a hood fan or exhaust fan. The range exhaust fan or hood fan can be a simple budget model which usually comes with a lamp holder and a one or two speed exhaust fan. More expensive and stylish exhaust fans may be selected to blend in with designer kitchen appliances. Many of these exhaust fans will have multi-speed capabilities, and a wide range of lighting styles with light level controls as well. The power requirement is generally just a few amps, so a dedicated circuit is not required, unless specified by the exhaust fan that you have purchased. Weather you choose a basic economy hood kitchen exhaust fan, or you decide to spruce up your kitchen with a stylish designer exhaust fan, an electrical power supply will be required. Most kitchen exhaust fans only require a 120 volt circuit which may be extended from a 120 volt receptacle outlet which is provided for a gas range, or the circuit may be provided by extending a counter top receptacle circuit. 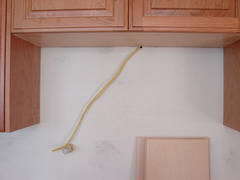 The circuit wire may be installed as a length of cable that will stub or loop outside of the center portion of the area of the upper cabinet located above the range. Typically this loop of wire is fastened onto a nail which is bent outward causing the loop to be supported. The sheet rock installed will see this stub and understand that the wire is to be left protruding out of the sheet rock. The electrical circuit cable is routed into the built in junction box which is provided with the exhaust fan unit.